On Friday, a three-member BJP delegation comprising former chief minister and MP Bhagat Singh Koshiyari, BJP in-charge of Uttarakhand Shyam Jaju and general secretary Kailash Vijayvargiya met Governor K K Paul, claimed that the Harish Rawat government was in a minority and sought its dismissal. MLAs scuffling with each other inside Assembly. After high level drama in Uttarakhand Assembly on Friday evening, 35 MLAs, consisting 26 of Bhartiya Janata Party and 9 rebels of the ruling Congress have reportedly flown to New Delhi. The move comes as the latest in series of developments which have led to a political crisis in Uttarakhand. It has also sought BJP has staked claim to form a government with the help of rebel Congress leaders. 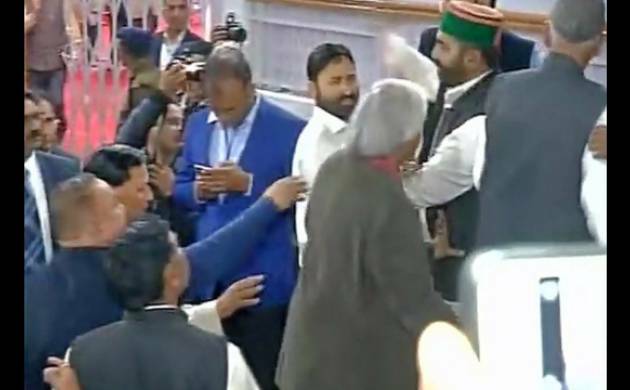 Ugly scenes were also witnessed in the assembly after a fight between Uttarakhand Ministers Harak Singh Rawat and Mantri Prasad Nethani witnessed inside the state assembly on Friday over the demand for voice vote on the Finance Bill. The ruling congress have 35 MLAs, while the opposition BJP has 26 MLAs in the 70 member assembly. The BJP is now claiming the support of 9 rebel MLAs. Among the rebellions, Former CMs Harak Singh Rawat and Vijay Bahuguna are the prominent faces in the state.